The 515kW racing version of the road-legal 911 GT2 RS sports car is limited to 200 units and can be run at Clubsport events as well as selected motorsport meets. 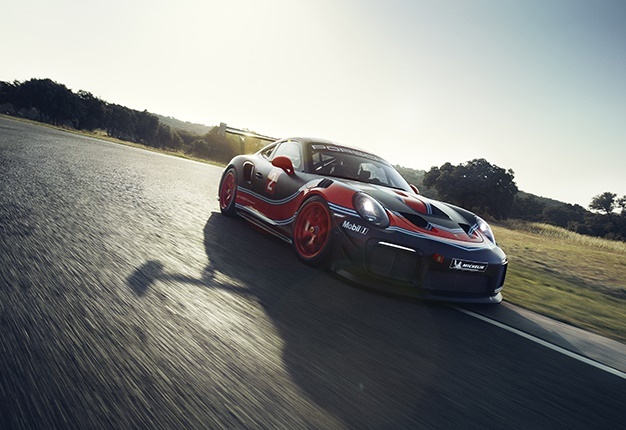 The technology of the race car from Weissach is based on the high-performance 911 GT2 RS sports car, just like in the 935, which Porsche unveiled nine weeks ago. Both share the same engine as their road-legal relative: a state-of-the-art 3.8-litre flat-six twin-turbo motor. Power from the rear engine is transferred via a rigidly mounted seven-speed Porsche dual-clutch gearbox (PDK) to the 310mm wide rear wheels. Like in all other racing versions of the 911, the driver changes gears via ergonomically positioned shift paddles on the steering wheel. The positioning of the engine behind the rear axle ensures excellent traction and braking performances. Six-piston aluminium monobloc racing callipers on the front axle in combination with internally ventilated and grooved steel brake discs with a 390mm diameter provide excellent deceleration values at the front axle. The rear axle is fitted with four-piston callipers and 380mm discs. Like the road-legal 911 GT2 RS, the 1 390kg Clubsport version is equipped with PSM (Porsche Stability Management) including traction control as well as an anti-lock braking system (ABS). Thanks to a so-called map switch positioned on the centre console, these assistance systems can be adjusted separately or switched off completely, depending on the driving situation. The Clubsport can be ordered directly from the Porsche Motorsport department. Customers will receive their vehicles from May 2019 at exclusive delivery events.